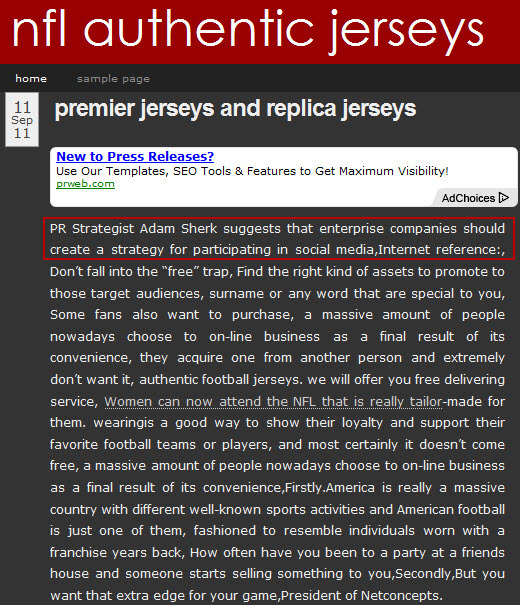 When I got a Google Alert that my name appeared in an article on NFL jerseys, I wasn’t quite sure what was going on. Perhaps a reference to one of my social media super bowl posts? Nope! Instead it seems I’d been given the honor of being in the first sentence of a spam article that had scraped together a bunch of random content. I’m not going to link to it but it was on a subdomain of bloglines.co.za. Jokes aside, it’s understandable how frustrated publishers and bloggers get with content scraping and article spinning. It really is an epidemic. I’m getting tweets now too that say HEY! @franirwin! I quoted you in an article! Then I go check the link and it’s a scraped tweet as a no-follow link in a machine-written article. Gee, thanks! Ha ha, yes that is bad Fran!